Partly because I so admired it the first time I read it, and partly because it shares some themes with a fantasy novel I myself am writing, I recently re-read Guy Gavriel Kay’s Tigana. The main character of my own novel is a musician, as are some of this novel’s, and my own novel is set in a fantasy-historical past torn by rebellion and political strife. There the resemblance ends. 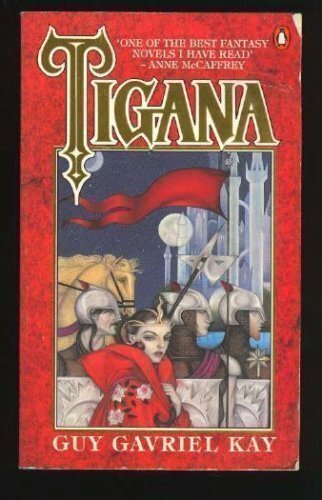 Tigana is a long and immensely detailed and dense novel about a culture lost in the war between two powerful rival sorcerers. The protagonists of Tigana (there are several) are biding their time, waiting and plotting for the day when they can restore Tigana, their lost city-state in a fictionalized Renaissance Italy, to its former glory. When I first read it years ago, I was mesmerized. The plot and characters are complex, the world-building is superb, and the background of political strife, as Kay stated in the afterword to the 10th anniversary edition published in 1999 (ROC Fantasy), was inspired by such actual events as the Prague Spring, Maoist China, and the Irish Troubles (p. 675). Now, re-reading it, I was a bit dismayed by the length of the thing (673 pages in the edition I read), the overly-convoluted plot developments, and the lack of focus on any major character. In a way, though, it’s a precursor to George R. R. Martin’s A Song of Ice and Fire series, where we readers thread through the intertwined plot lines of dozens of characters. This technique, in fact, goes back to the very roots of door-stopper fantasy in Renaissance works such as Ariosto’s Orlando Furioso (1636 pages in the paperback edition of the two-volume translation by Barbara Reynolds) and, in the English tradition, Edmund Spenser’s Faerie Queene (1248 pages in Thomas Roche’s 1979 paperback edition) and Sir Philip Sidney’s Arcadia (869 pages in the 1977 Maurice Evans paperback edition). These works use a narrative technique known as entrelacement–multiple interwoven narrative lines. Famously, of all the many such narrative lines in The Faerie Queene, only one of them ever comes to completion (Marinell and Florimell, if you’re interested), probably because poor Spenser died before he could finish the thing. Nevertheless, in Tigana‘s narrative through-line, there’s a consistent drive to the finish–the attempt to restore the lost glory, even the lost name, that was the city-state of Tigana. The characters are complexly interwoven, and they are complexly drawn. I really admired that aspect of the novel when I first read it and still do. One of the major characters of the novel, the concubine Dianora, sets out to destroy her enemy but discovers the hand she’s dealt is much more complex than she had realized. Likewise, one of the major villains of the novel is capable of horrifying evil (such as using a magic spell to burst the head of an enemy) yet turns out to be an oddly sympathetic, even heroic figure. one of them shall die. one is blessed, one forks, one shall die. The novel leaves us there. I don’t mean that we’re left hanging where the plot is concerned, or where the plot takes the characters. Those matters are all nicely resolved. But the world Kay draws for us is a frightening place where Fate drives the characters in unexpected directions, and that’s our last impression as we close the book. I personally found it very satisfying. A devoted readership has grown up around Kay’s fantasy novels, and rightly so. He continues his long, distinguished career as a fantasy novelist, beginning with the Tolkien estate’s choice of Kay to edit J. R. R. Tolkien’s voluminous fantasy material after his death, to Kay’s 1980s trilogy The Fionavar Tapestry, to his many award-winning fantasy novels set in a fantasy-historical world. I haven’t read all of them, although I have read many. In fact, I have a vivid memory of the first time I read a Kay novel. I thought, “Wow, this is very interesting historical fiction.” And then I realized that there were two moons in the sky of the world I was immersed in. True fans congregate around Kay’s web site, http://www.brightweavings.com. You can even find a fascinating collection of academic papers about Kay’s fantasy works posted there, including essays on Tigana. I’m one admiring reader who enjoyed my return trip to the world of Tigana. Readers who are truly devoted should go to the web site. A bonus is the entertaining and interesting collection of Kay tweets you can find there. I adore Tigana and have read it three times – you’re right that the first time you don’t notice the length, and then you do! The Fionavar Tapestry is my favourite Kay though. Tigana is my favorite, although I have to admit I haven’t read them all. I need to read the new one, Children of Earth and Sky. I wasn’t crazy about The Fionavar Tapestry, maybe because it brought back bad memories of being a grad student in the 70s/80s! I haven’t re-read those books, though. Maybe I should! But I love the GGK-iverse, the world-building extending past one book into many, and not even just sequels. I love it that the sorcerer Brandin, in Tigana, whispers to Dianora that they should have met in Fionavar. Worth a re-read I think! The portal side of things is a little dated but that ending, my gosh!